The building where Gendros is alongside is two thirds of the way, what is now Upper Kingshead Road. Gendros Farm's position in the red ring. The farm has several buildings in the this view. The newly built homes of Gendros Avenuse East in the upper right of the image. Genros Farm behind Gendros School. There are roughly seven building on the farm. Gendros a built up residential area. 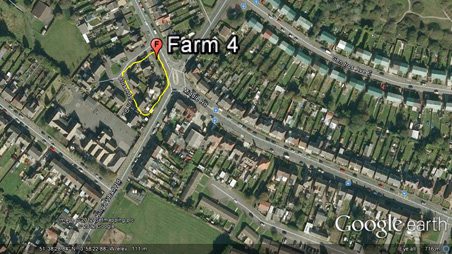 Farm 4* - Gendros farm building area now occupied by about 22 houses, now known as Clos Aderyn Du which translates as Black Bird Close. This name links in with the Raven Hill area. 4* - The number relates to my own research. Gendros farm, showing 1 building joined to only one access which was Middle Road, no Kings head Road or Upper Kings head Road. 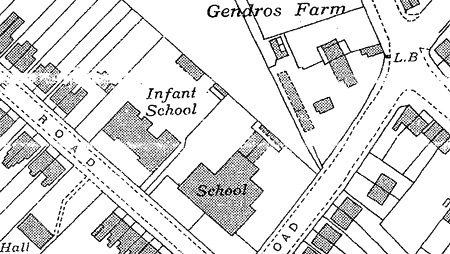 A place called Gendros with 2 buildings opposite is on a road linking Pentregethin Road and Middle Road; it looks like Weig Road later joins this now lost road to Carmarthen Road. Land Owner - Sir John Morris, Land Occupier - Joseph Griffiths, Land - 9 parts could be 10 with at least 22 acres. The farm isn't labeled but has a single building labeled as (671,.563) and a number of trees around the property, nearest building in area (678) across the road, where a small semi’s are next but one right to Martin’s corner shop today (2013). Access: Directly onto Middle Road. Middle Road is shaped like today (2013) but has no labeling. No Upper Kingshead Road only a track to an old coal working. The farm (Land No. 227), (Area size .563) is labeled diagonally right of the property (Land 229, Area size 5.446), today this would be, right of Upper King's Head Road, roughly 500 feet square and possibly used by the farm. 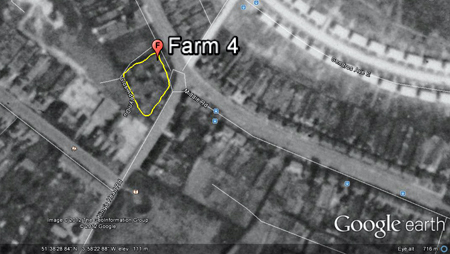 The farm has 4 building in total, 3 joined and 1 close to the Middle Road boundary. King's Head Road is labeled. The farm (Land No. 227), (Area size .563) is labeled diagonally right of the property (Land No. 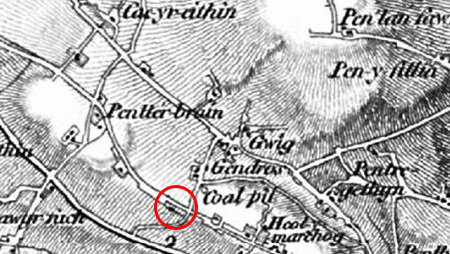 229, Area size 5.446), today this would be, right of Upper King's Head Road, roughly 500 feet square and probably used by the farm. The farm has roughly 6 buildings. Gendros School, infants and juniors are now built along most of the current building (2013) on Armine Road. Outside the farm on the corner of King's Head and Middle Road there is a W.T.= Water Tap. 1940 OS Map Swansea Co. Boro. Swansea PH. 1:2,500. Gendros Farm is labeled next to the buildings; there are no numbered labels as above. The farm has roughly 8 buildings, but now has less land to work as diagonally right is a full row of houses on Middle Road as it is today 2013. No reference to a water tap, but roughly where this is now a L.B.= Letter Box..
Gendros Farm is labeled next to the buildings. The farm now has roughly 10 buildings. As Gendros Avenue East and West housing has been built, Upper King's Head Road is now built and labeled. Martin's corner shop has now been built, Henry Martin took on the shop in the late 1940s. L.B.= Letter Box is still labeled. El P= Electricity Pole or Pillar on the corner of current Martin's corner shop Middle Road (2013). r.p.= reference point outside current Martin's corner shop Middle Road (2013). The farm has now been demolished. 1845 Page 81, Parish of Swansea Higher. 1869 (a) Swansea Polling District, The Hamlet of Swansea Higher. Mrs. Elizabeth Jeffreys, farmer Gendros farm. "Penllernarch Road (Mari Jacob) I also recollect and the Gendros Farm worked by John and Ann James;"
"Kelly's detailed directories of South Wales at the turn of the century confirm a number of Mr. J. Davies' recollections. The 1906 edition, for example, refers to Chas Vickery, cowkeeper, Cae-y-Babell; Thomas Passmore, farmer, Cae-y-Babell; John James, farmer, Gendros farm; and Wm. Williams, farmer, Tyrbach." "The land bordering King's Head Road was deemed the most suitable place to build the school. Behind this parcel of land was a farm which in future years was used as an educational resource and in some cases a place of part-time work for a few of the children." Also on the same page is a very interesting drawing of the layout of the farm probably in the early 1940s. To my knowledge there is only one remaining piece of evidence that Gendros farm was ever on the corner of King's Head and Middle Road. Today 2013, if you walk passed Gendros School towards Middle Road, you will see a low level stone built wall approximately 200ft long and over a foot deep, which was the farm's boundary wall. More personal information about Kenny's family history of Gendros farm is written along with photos in this FORUM LINK. More work to done with 1838 and look at 1843 Tithes. Written this way on 1838 on Tithe Apportionment. Written this way on 1869 Polling Details.